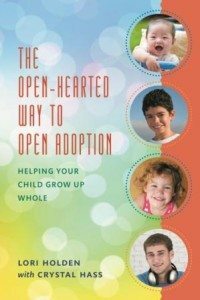 You already know this is the place to participate in adoption and infertility-themed virtual book club discussions. But with this latest option — a book released into the world just today — we’re adding in a twist. 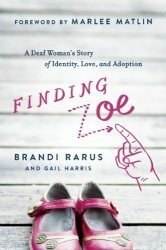 You may think you’ve explored all facets of adoption, but Finding Zoe by Brandi Rarus adds in an additional component that you may not have given much thought. When I took teacher education classes years ago, I chose to write a research paper on deafness as a disability, and was surprised to discover that many deaf people don’t consider deafness a disability. It was helpful to resolve some of my ignorance on the issue. So with this post I invite you to read Finding Zoe and see if you have any blind spots (so to speak) about either adoption or Deaf Culture that can be filled in with an enlightening memoir. Appropriately so, actress Marlee Matlin has written the foreword to Finding Zoe. The first part of the book is an engaging primer on deafness, Deaf Culture and various factions and philosophies within it (reminds me of Adoption Culture). Brandi is the perfect person to share this, as a former Miss Deaf America and a bridge between two sometimes-polarized factions in the deaf community. The latter part is on how daughter Zoe found her way through four other homes before landing with Brandi and her family 8 months after she was born. 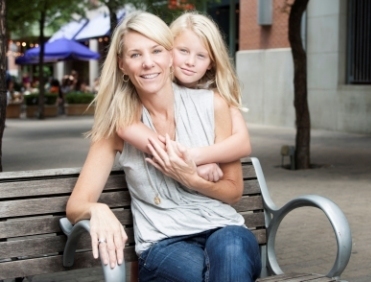 Zoe, now 10, is the child at the center of a very open adoption. In fact, both her birth parents agreed to be interviewed and the book was released with their permission. Brandi and her writing partner Gail Harris do an admirable job telling the story from the viewpoints of many of the participants in it. Because of the contentiousness of some of these relationships at some points in time, that was no small feat. I’m confident you’ll find Finding Zoe — and the upcoming discussion about it — worthwhile. You are invited to participate in this Virtual Book Tour. Be ready to discuss it in December (well before the holidays) with other readers. Note: You don’t need to have a blog to participate. 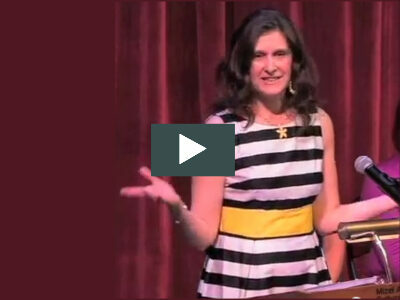 You can write your post in a space created specifically for blogless readers. Everyone is invited to participate. The book is available via Amazon in hard cover ($16.72), Kindle ($10), direct from BenBella books ($15.40) and at various other booksellers. I’ll provide the forum here; you just need to provide your own coffee and danishes (or wine and Cheetos, if you’re so inclined). Author Brandi Rarus will participate in this book tour by responding to reader questions. So if you think of one to ask her while you’re reading the book, capture that thought. October 31: Last day to sign up for the tour. You’ll find the “Book Tour Signup” form below. Read the book between now and mid-November. Reserve it from your library or purchase from your favorite bookseller. November 14: Come up with up 1 or 2 discussion questions to ask of other participants (not Yes-or-No). A question for the author is optional. Shortly thereafter, you’ll receive a list of questions from other participants. From this list you will choose any 3 to answer on your blog. If you don’t have a blog, one will be provided for you. December 2: Posts go up! Links to participant stops on the book tour will be posted here on LavenderLuz.com so you can read, comment and discuss with each other — just like a face-to-face book club, but with less coffee cake and more keystrokes. Please follow this blog and spread the word to interested parties (tweet, share, G+ with the buttons at the bottom of this post). Did I mention you need to sign up? Fill out this form ↑ . Making myself a note to hit you up then. Well this definitely sounds like an amazing book. I’m in! So glad you’re participating, Kim! The book sounds fascinating, Lori! 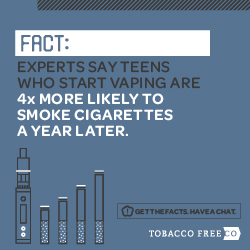 I think we’re all a bit ignorant on this issue. Sounds like a WONDERFUL topic!